If you are engaging the tent rental business, you must want to save the cost and increase the value. Even for an owner, you also want to buy one thing but have two functions. 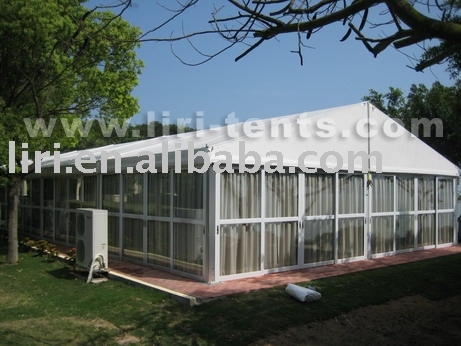 Now, Liri Technology Co., Ltd designs a new event tent to meet your special need. DNHT series which belong to dome tent is available in 6 m, 9 m, 12 m and 15 m. The special roof is easy to catch the eyes which is usually used for the wedding, party, corporate activity. If your customers want the A shape tent or you want to get a feeling of freshness and don not want to waste the money, it can be realized. Just remove the arch connector and joint with the plug-in ridge connector, and then you can get a totally new one-the new shape , the different size, to meet you need. Furthermore, choose the different accessories for the different event, also can change the tent totally.